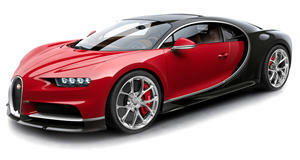 Meet the fully electric sports car built to celebrate Bugatti's 110th anniversary. The Bugatti Type 35 is considered to be one of the most successful racing cars of all time. Built in a number of configurations, these sports cars were winning 14 races per week at their peak. They were instrumental in elevating the Bugatti brand to new heights and even recreations of the originals can sell for huge sums these days. Back in 1926 Ettore Bugatti and his son Jean built a half-scale replica of this race car for Ettore’s youngest son Roland as a fourth birthday present. It proved to be a big hit not only with Roland but also customers visiting Molsheim at the time. The Bugatti ‘Baby’ eventually entered production and 500 copies were built between 1927 and 1936. They have since become just as treasured by enthusiasts as the full-size cars and one sold for an impressive $110,000 at Pebble Beach in 2008. To celebrate Bugatti’s 110th birthday, the company has decided to introduce the Baby II, a modern take on the original Baby. This one will be three-quarters the size of the ‘20s Type 35 which means that adults will be able to go for a ride too. Technical highlights include removable lithium-ion battery packs, a limited slip differential, regenerative braking, and two power modes. Child mode will deliver 1.3 horsepower to the rear wheels allowing the car to top out at 12.4 mph while adult mode adds another 4 hp taking the maximum speed up to 28 mph. Chiron owners used to a bit more grunt will be pleased to hear that the Baby II comes with an optional Speed Key which unleashes the full 13.4 hp and removes the speed limiter altogether, let’s hope the tires will be able to cope. Prices for the Baby II start at $33,700 excluding taxes and delivery charges. That makes it either a massive bargain seeing as you are getting three-quarters of a Type 35 for a mere fraction of what the real thing costs, or an expensive plaything for those who already have a garage packed with full-sized supercars.